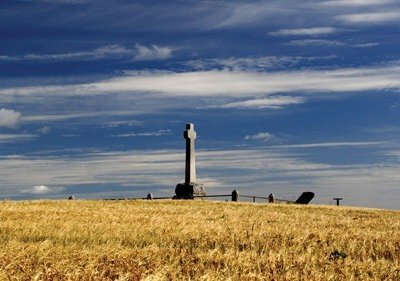 The Battlefield of Flodden is the location of the major engagement in the Flodden campaign, where the armies of James IV of Scotland and the Earl of Surrey, met on 9th September 1513. The battle occurred somewhere in the fields to the south of Branxton on the slopes of Branxton Hill, starting late in the afternoon and lasting for 3 hours. By nightfall James, most of his nobles and perhaps 10,000 of his countrymen lay dead. 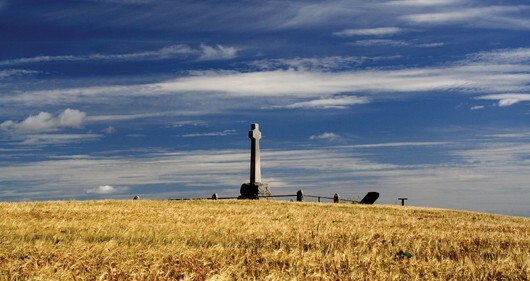 Today the battlefield is marked by a granite cross, erected in 1910, and a battlefield trail created and maintained by the Remembering Flodden Project. The Battlefield of Flodden is the site of the major engagement between the forces of James IV of Scotland and those of the English Crown commanded by Thomas Howard, Earl of Surrey. The engagement occurred during the late afternoon of 9th September 1513, following over three weeks of manoeuvring by the Scottish forces and the arrival in the area of the English Army of the Northern Marches three days previously. For three hundred years the engagement was known as the Battle of Branxton Moor and was only romanticised as the ‘Battle of Flodden Field’ by Victorian authors and historians during the 19th Century. The name Flodden actually pertains to the hill, 2 miles to the south of the battlefield, where James IV encamped his army in the week prior to the battle. Following Henry VIII’s invasion of France during the early summer of 1513 the French King Louis XII invoked his alliance with the Scots, agreed the previous year, requesting that James IV of Scotland invade northern England in the hope that it would distract Henry and force his return home. In response James IV gathered forces both at Boroughmuir in Edinburgh and at Ellemford near Duns and crossed the River Tweed with his army somewhere near Coldstream on 25th August. Once on English soil James immediately set about securing his line of supply by besieging the castles of Norham to the east and Wark to the west. Within a week he held both sites, giving him control over an 8 mile stretch of the River Tweed and the national border. Next he secured his eastern flank by taking the castles of Etal and Ford and then moved his army onto the summit of Flodden Hill. There he began to fortify the position. Evidence suggests that the Scottish army, perhaps between 60-80,000 strong including the non-combatant men, women and children who were accompanying the fighting force, spent more than a week building modern fortifications around the top of Flodden Hill, along the adjacent ridge of Flodden Edge and on to the knoll to the west known as the King’s Chair. Before his departure to France in June, Henry VIII realised the potential for just such an invasion and appointed Thomas Howard, the Earl of Surrey, Warden of the Northern Marches, leaving him with instructions to prepare defences against the threat that James IV posed. In 1513 Surrey was 70 years old, a skilled and longstanding soldier whose experience went back beyond the Battle of Bosworth of 1485, where he had fought for Richard III against Henry VIII’s father, Henry Tudor (thereafter Henry VII). Surrey turned this experience to good use and as early as July was making arrangements, including the stockpiling of grain to feed any army he may have to raise. Once word of the Scottish invasion reached him, Surrey ordered an army to muster in Newcastle by 1st September 1513. At this time his main fear seems to have been that the Scots would slip away across the Tweed before he had a chance to engage them in battle. In an attempt to avoid this he wrote to James IV in early September asking him to engage in a contract to fight a battle, which would take place near Milfield no later than 9thSeptember. While contracting a battle is a very strange concept in modern diplomacy and politics, during the early 16th Century, at the very end of the medieval age, it was a matter of chivalry and there is no doubt that James would as a matter of honour, in his own mind at least, have had no option but to fulfil the contract once it was agreed. James IV seems to have put the time he spent waiting for the English army to good use. Recent excavations on Flodden Hill have uncovered the remains of defences that include strong stone and earth fortresses, trench systems and redoubts. Certainly Flodden Hill was well chosen as it looms over the north side of the proposed battlefield of Milfield Plain, and controls the main route north from Wooler to the Tweed, passing between the eastern foot of the hill and the River Till. It is perhaps no surprise then that when the Earl of Surrey finally arrived in Wooler on the evening of 6th September he again sent communications to James IV, this time informing him that he had no intention of assaulting his prepared positions on Flodden Hill (a sure indication of the strength of the fortification) and asking that James come forth onto the plain and give battle as had been agreed. When Surrey’s herald arrived at the Scottish camp, James refused to meet him and instead sent word that he would not be dictated to by a ‘mere Earl’. While there is no record of exactly how that particular Earl reacted to this slight, his actions over the following 48 hours give us some sense of his mood. Clearly deciding that James would not fight at Milfield, he sought a means by which to gain the best advantage over the Scots’ fortifications on Flodden Hill. To do this he decided to try and outflank the position and effectively place himself between James and Scotland, severing his lines of supply and blocking the line of any potential retreat. During September 8th he marched his army from Wooler Haugh to Barmoor the traditional camping ground of English Armies for over 500 years. There the army presumably spent a miserable and cold night in what are said to have been damp rainy conditions, before being roused early to continue their march. On the morning of 9th September the English fighting contingent (between 20-25,000 men) marched away from Barmoor to the north and west, leaving their baggage train and non-combatant followers in the camp established the night before. The Earl of Surrey’s son, the Lord Admiral, also called Thomas Howard, is said to have led the vanguard including all of the heavy equipment (artillery and supporting wagons) to the bridge at Twizel where they appear to have crossed the River Till unopposed. Other elements of Surrey’s force are thought to have crossed the river further to the south though the exact locations of these crossing points remain a matter of conjecture. Regardless of this historical uncertainty, James IV’s forces on Flodden Hill woke on the morning of the 9th to effectively find themselves outflanked and with their supply and communications routes back to the Scottish border either cut or close to being so. While again there are no contemporary written accounts of the decisions taken on Flodden Hill that morning it is reasonable to assume the order was rapidly given for the army to prepare to move out of their fortified positions, with the fighting force of perhaps 30,000 men leading the way and the heavier Scottish guns following on as soon as they could be moved. What is far from certain is the intention of James IV during this movement. Historians and archaeologists alike agree that he may have either been seeking to retreat hoping to slip past the English vanguard before they completely cut his line of retreat, or that he may have been turning to face his enemy, seeking the most advantageous ground so that he could fight. Regardless of his intent, fighting was the result. The move from Flodden Hill to Branxton Hill, no more than 2 miles, left James’ army facing that of the Earl of Surrey arrayed across the lower ground somewhere to the south and possibly west of the Church of St Paul in Branxton. This manoeuvring and forming up of the two armies took until the late afternoon, but once the engagement commenced the outcome was settled in about three hours. It is said that between 1000 and 4000 English solders were casualties and that between 7,000 and 11,000 Scots also lay dead, including King James and most of his important nobles present on the field. However the events of the late afternoon of 9th September 1513 were not the end of the story. In the hours that followed the battle itself, the Scottish army was effectively in rout, retreating in total disarray towards the Tweed at Coldstream and possibly west along the Bowmont Water towards Yetholm. These men would have been hunted all the way to the border by English detachments. At the same time a force of at least 500 French mercenaries, who had fought on the Scottish side, are said to have been set upon by the retreating Scots and slaughtered to a man. The English now also set about destroying and looting the non-combatant parts of the Scots force, raiding Flodden Hill and taking or burning anything of value, attacking the Scottish wagon train (a group of perhaps 25,000 - 40,000 people) with untold consequences for those civilians who had followed the fighting men south and who were now effectively caught on the wrong side of the English lines. In the days that followed the captured Scottish guns were taken first to Etal Castle for safe-keeping whilst the bodies of the Scots nobles were retrieved from the battlefield and eventually repatriated, possibly by the nuns of Coldstream Priory. Meanwhile locals, prisoners and the fighting men of the English army would have worked to clean the battlefield, burying the dead but at the same time stripping them of clothes, possessions and of anything valuable. In a final twist, a contingent of English Borderers, said to have been led by Northumbrians, feeling that they had not had their fair share of the battlefield booty, detached themselves from the army and attacked the English camp and wagon train at Barmoor, again leaving behind them an unrecorded number of dead and injured amongst the non-combatants of the English force. Although the rout and subsequent plundering and attacks on the two camps would have been intensive and bloody, it seems the mopping up of the remaining Scottish forces was relatively short lived. Within a week Surrey dismissed the vast majority of his army, an essential move at the time so he could avoid paying their wages for a period longer than was absolutely necessary. In Edinburgh, however, the expectation was obvious - that Surrey would continue northwards to claim the city. The construction of the Flodden Wall around the city limits was begun immediately. The Battlefield of Flodden, Branxton is a registered battlefield. The Battlefield Memorial Cross is a listed grade II structure. Park in the Flodden Monument car park 400m to the west of the Church of St Paul, Branxton. From Cornhill - follow the A697 south for 2 miles, until you see signs for Branxton on your right. Follow this single track road for 1 mile, until you reach a T-junction on the west edge of Branxton, by the village hall. Take the very tight turn to the right (almost back on yourself) and follow the road for a further 500m, past the church on your right until you reach the Flodden Battlefield car park on your left. From Wooler and the south - pass through the village of Milfield on the A697 and continue north for 4 miles, until you see the turn for Branxton on your left by the Bluebell Inn (currently closed). Follow this winding, single track road for 2 miles into the village of Branxton. At the far end of the village (by the village hall), take the left turn and continue for a further 500m past the church on your right until you reach the Flodden Battlefield car park.